Lately, I’ve been feeling a little stuck. No matter how long I stare at the kitchen, I’m just not sure what to make. And no matter how long I stare at the blinking cursor on the screen, I’m just not sure what to write. I just don’t know why, but I’m just not feeling that same compulsive drive to create. Perhaps it’s because the spring is taking longer than usual to settle in this year, leaving us in a limbo of not-quite-winter and not-quite-spring where we swing from snow boots to sandals almost overnight. It’s no wonder I can’t decide what to eat… after all, it’s a wonder I can figure out what to wear most days! Whatever the reason, though, I’ve decided a mental kick in the pants is in order. Because even if Mother Nature isn’t ready to move on just yet, I most certainly am. 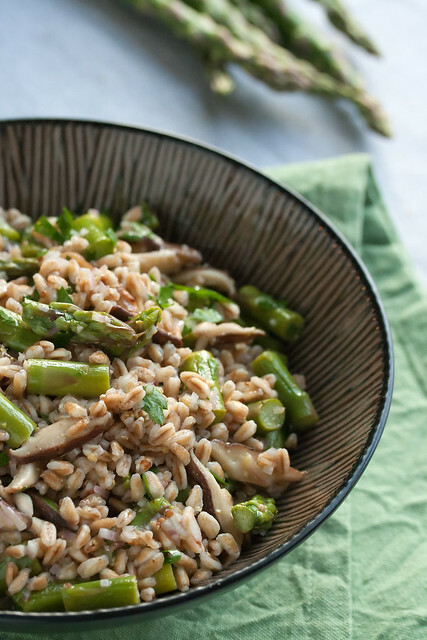 This farro salad with asparagus and shiitakes feels like a good start. Farro, if you’re not familiar with it, is an Italian grain made from dried spelt berries, and it’s delightfully chewy and nutty and hearty. It’s often used in soups or prepared risotto-style, but I like it best in salads like this one, where its toothsome texture is a lovely contrast to the softness of the shiitakes and the grassy brightness of the asparagus in this salad. It’s a dish that’s substantial enough to stand up to the occasional cold snap, but that’s still a step in the right direction – bright and full of fresh spring flavours. 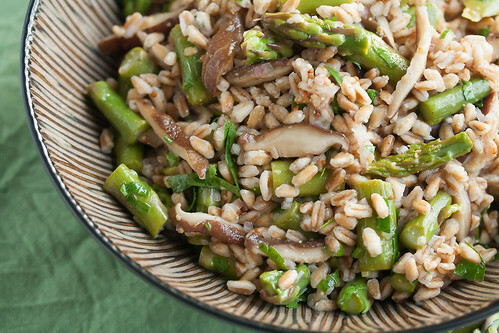 Make the most of the blink-and-you'll-miss-it local asparagus crop with this substantial salad made with chewy farro, tender-crisp asparagus and earthy shiitake mushrooms. In a large pot of boiling salted water, cook the farro for 28 minutes, or until almost tender. 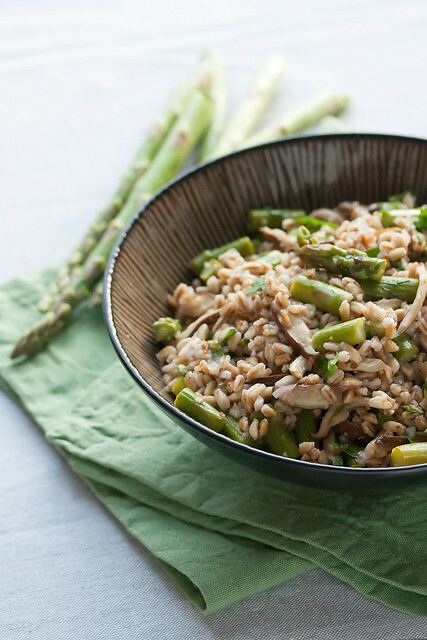 Add the asparagus and continue cooking for 2-3 minutes longer, or until the farro is tender and the asparagus is bright green. Drain and run under cold water to cool off. While the farro is cooking, heat 1 tbsp olive oil in a large skillet set over medium-high heat. Add the shiitakes and sauté until soft and starting to brown, about 5-7 minutes. Add garlic and continue cooking until fragrant, about 1 minute longer. Remove from heat and set aside. 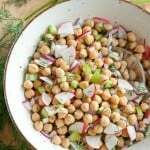 In a large salad bowl, whisk together the remaining 3 tbsp olive oil with the vinegar, mustard. salt, pepper and shallot. 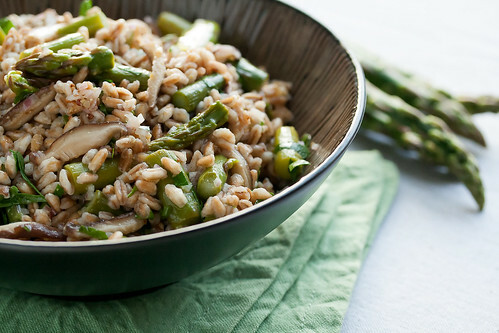 Add the farro, asparagus and mushrooms, and toss until evenly coated with dressing. Add the parsley, and toss again until everything is combined. Before serving, taste and adjust the seasoning with more salt and pepper, if needed. This salad is best when fresh, but leftovers will keep for up to 3-4 days in the refrigerator. You can find farro (or spelt, as it's sometimes labelled) in most gourmet specialty stores, as well as larger well-stocked bulk food stores. If you can't get your hands on any farro, though, you can use wheat berries or rye berries instead - just cook as per package directions, and add the asparagus in the last 2-3 minutes or cooking. yummmmmm Made this for lunches this week but we can’t seem to keep our forks out of it. 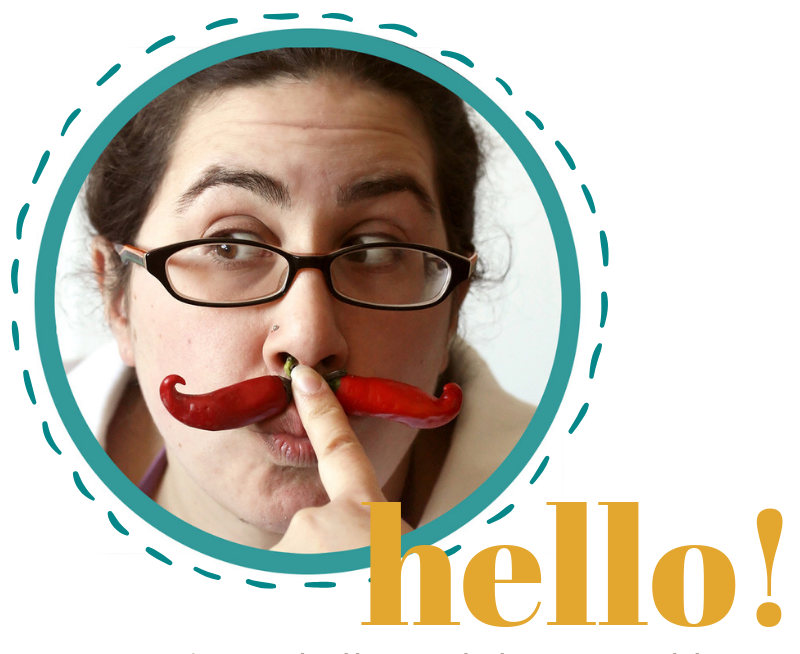 ;) I am so loving the pearled farro which I found @ Whole Foods in the bulk section. Thanks for giving me the nudge I needed to try something new. This looks fantastic! The kind of food that makes you feel like a superhero but has tonnes of flavour at the same time. I’m hoping I can find all the ingredients near me to try it! Let’s all hope that we can start enjoying more spring recipes like this one on a regular basis… this Winter is taking for ever to say goodbye! BTW I hope I could come up with anything near this when I’m fully inspired and energetic! 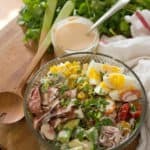 Great looking salad! Farro is relatively new to me, and I love it! I have cooked a few things with farro from the Whole-Grain Mornings cookbook. 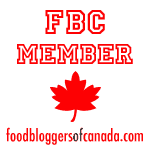 (this has helped me kick start spring and eating a little more healthy). 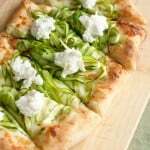 Asparagus always tastes like Spring! That and goat cheese. I get it with the not feeling creative at the moment. Perhaps if the trees would pop, we’d all feel a little better about things. My asparagus is just starting to poke through. And farro is one of my favorite things. I’ll be making this soon! Such a pretty salad! 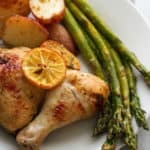 I love asparagus and after reading a couple of posts/recipes about it in the last half hour, I can tell I need to put it on my shopping list.